The kitchen is my happy place! It’s calming and I absolutely loose sense of time. I love getting lost in creating recipes, that are not only pleasing to the senses but also healing and full of nutrients. 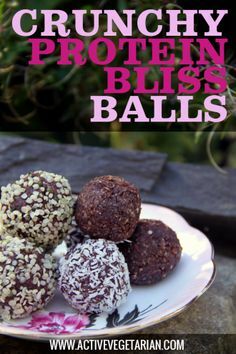 Last weekend I made these Bliss Balls! Put coconut and dates in a food processor and mix till you achieve creamy texture. Add remaining ingredients and process until all combined but dough is still chunky and sticky. Scoop about a tablespoon of dough and using your hands form a truffle. If you want to get all fancy, roll balls in toppings of your choice. Want More Raw Dessert Recipes?